Good and Mad is for and of its time. Traister covers the intersection of feminism and politics for New York magazine, and this, her second book, in some ways reads like an extended magazine feature. The quotes peppered throughout from feminists past and present would fit right into social-justice Twitter. The images “felt retro,” she wrote, in that summer of 2016, when a female president could happen. Just a few months later, she writes, “I scrolled through images on my social media feeds and saw another cascade of wrath” during the Women’s March. 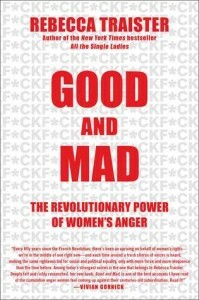 It was just the latest resurgence of women’s anger. Capturing the mood of the moment is where Traister shines, and her point — that there’s always something to be downright pissed off about — feels constantly relevant in the context of the 24-hour news cycle. 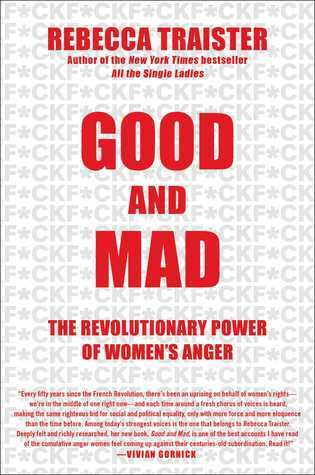 I read Good and Mad while pedaling on a stationary bike at the gym, when the hearings for Brett Kavanaugh, then the hearings with Christine Blasey Ford, were always on one of the televisions in my line of sight. I found myself getting some of the best workouts I’d had reading this book on a bike ride to nowhere, and that experience does underline the book’s cathartic effect. However, some of Traister’s anecdotes from 19th-century suffragist history to the second-wave feminism of the 20th century feel cherry picked. She looks back to the antebellum era for failures of intersectionality, those moments when the movement for women voting didn’t support the movement for African-Americans getting the vote. The parallels are there — women of color who were involved in the Women’s March expressed concerns about whether white women were being inclusive — but it’s a compartmentalized view of history. Later in Good and Mad, Traister zeroes in on white women who voted for Donald Trump, calling them complicit with their husbands and fathers, sons and brothers who have maintained patriarchal structures that have kept women out of power. But it’s too easy of an argument to make for a broad category of people. It ignores the complexities of the voting public and applies a stereotype to another group of women who were also clearly fed up and voted accordingly. Whether their anger counts, too, is an interesting question in feminist thought, and I would have liked to read what some of the intellectuals at the forefront of the current movement have to say about it. Instead, it’s given short shrift, as is conservative women’s anger. This isn’t the book to look to for a deep analysis of how Ann Coulter’s loud-and-proud brand of anger has made her career. Instead, this is a place to hone your talking points, hashtag resist. Points of policy feminists have been fighting for all along (health care and child care, for example) also get short shrift in Good and Mad. But Traister is preaching to a choir that already knows this, and really, any nits a critic picks won’t matter to that choir, who will buy this book and love it. The left-leaning liberal public has voted, on this book and elsewhere — just look at the record number of women who stepped into the halls of Congress earlier this month. I have a feeling that some of them might be good and mad, too.